This photo taken in 2006 provides a great "feel" and terrific view of the open desert with the OPD runner (then Team #57) leading what seems to be an endless line of runners and support vehicles from the competing teams. Click on the thumbnail to see the detail in the high-res JPEG. 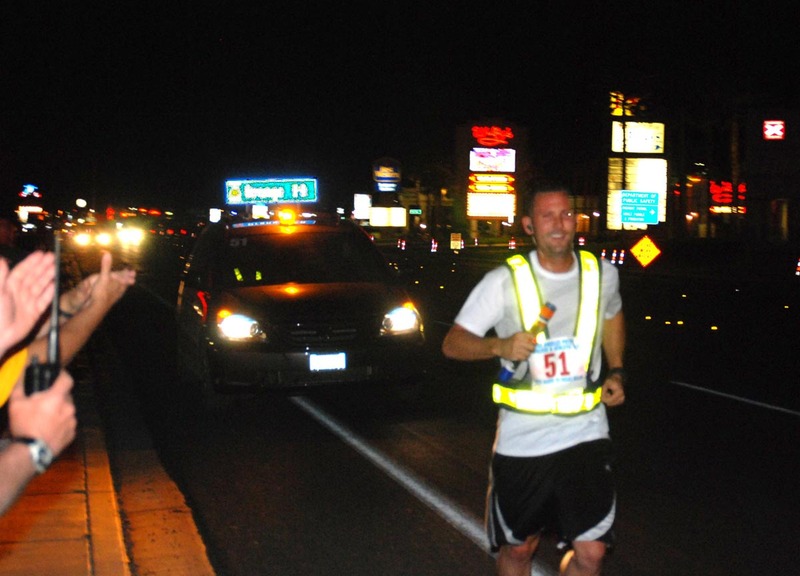 the runner exchange point at Stage 7 near Shoshone lights up. 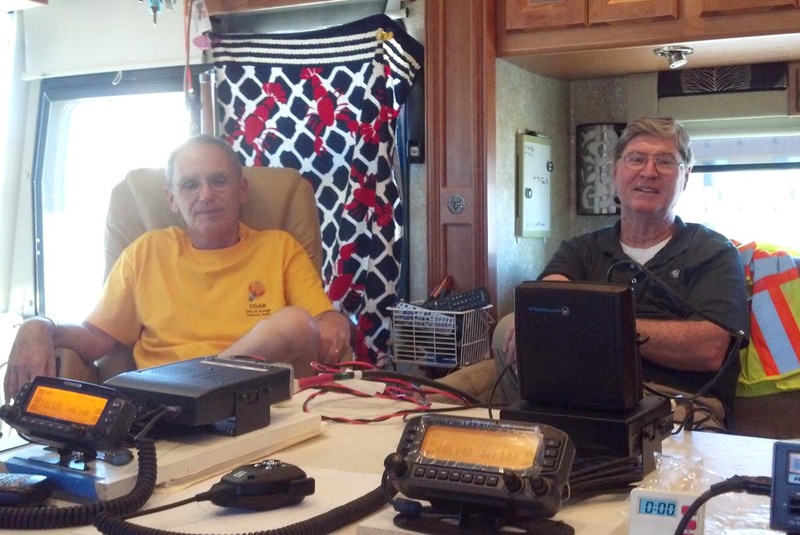 In Shoshone, (L-R) Rich KR6BA and Steve KB6ROL ran the Comm Center in Shoshone. 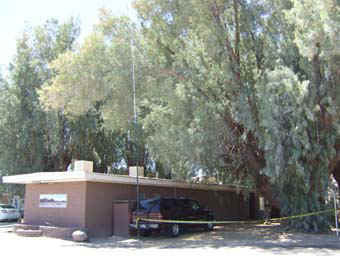 Behind the motel used as the Communi- cations Center in Shoshone, is the vertical antenna used to contact the cross-band repeater on 144 MHz. 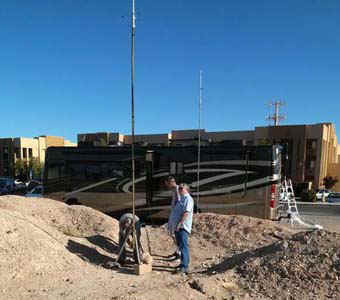 The tall vertical is supported from the trailer hitch of the SUV ...to allow the radio team to accommodate the motel always changing their room location around from year-to-year. 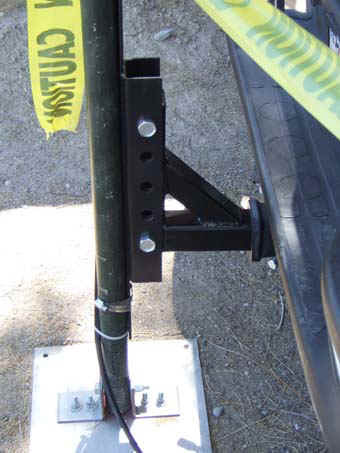 Here is a close-up view of how the trailer hitch supports the vertical antenna at the Shoshone Communications Center. 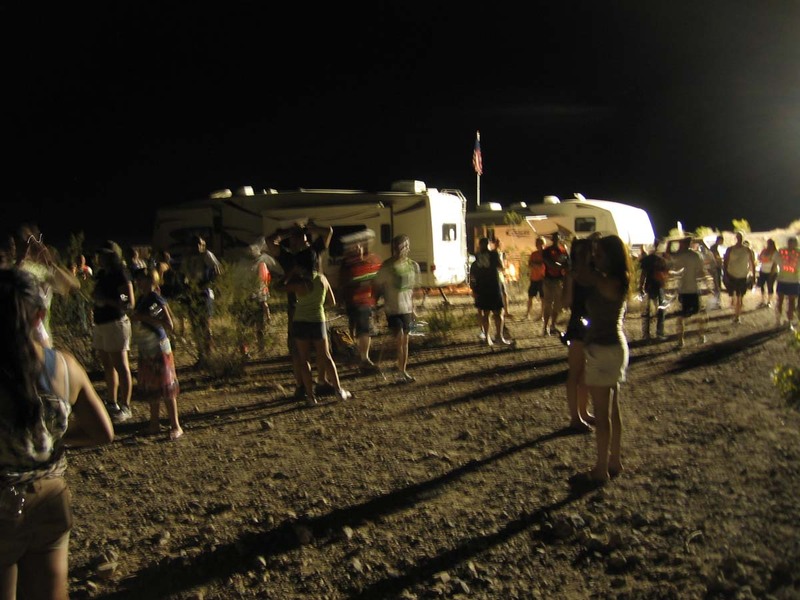 This is what the "night life" looks like at a runner exchange point. The area is crowded with waiting runners, staff, support people for the runners, transportation people for the finishing runners, and friends. 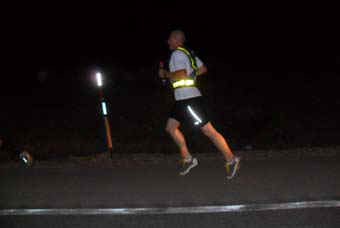 Here is a Team 051 member running through night. It gets very dark and the race is really spreadout by then. 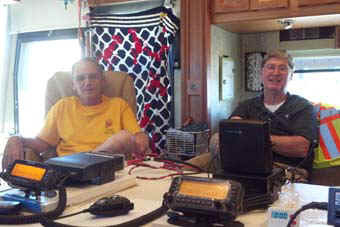 At Pahrump Comm Center, Dave KG6RWU (center) and Jay KI6WZU send a message to LV by cross-band (146 --> 441) repeater. Polly KG6CUK is on left. 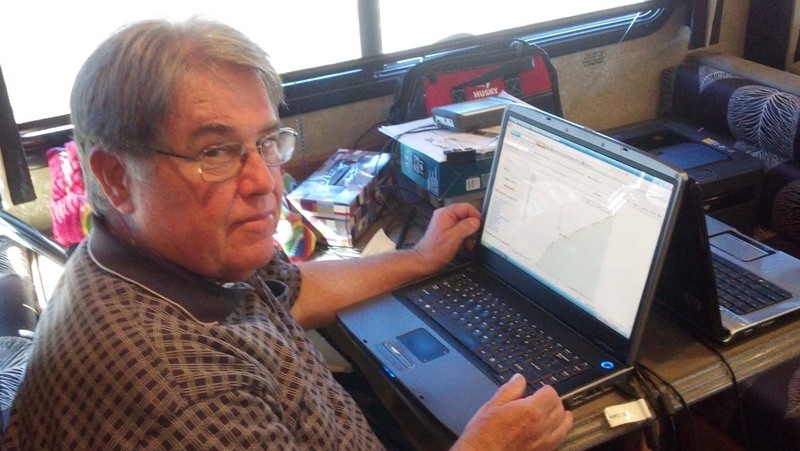 This year at the Pahrump Comm Center, the COAR APRS worked worse than any other year!! 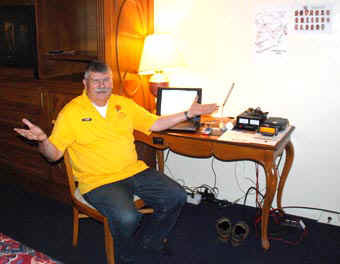 Ken W6HHC (at the APRS receiving and tracking set-up) throws up his hands in confusion after trying to determine why we received so few packets from the OPD beacon. 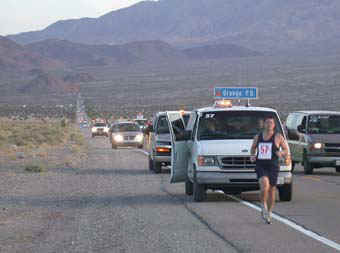 The Orange PD runner, Officer Kevin Plog, runs through the city streets of Pahrump on leg 11 of the race. 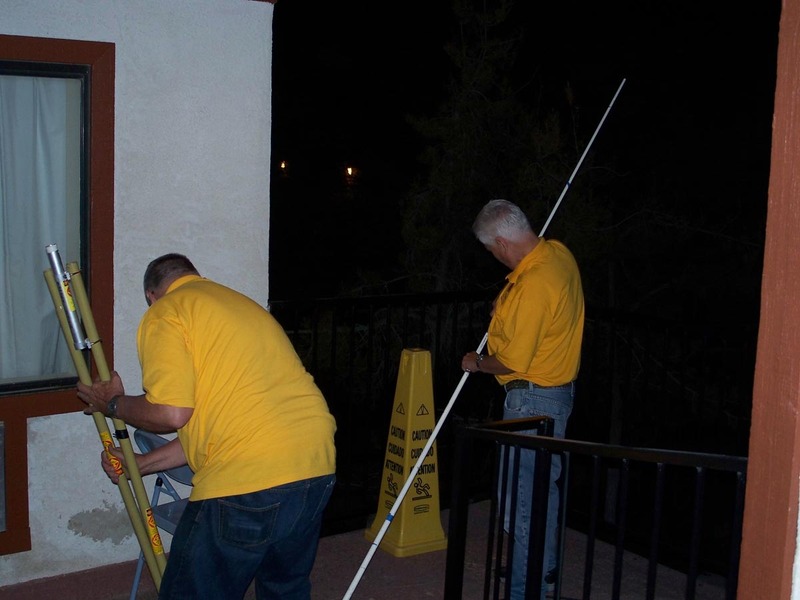 The radio operators stand in front of the Pahrump Comm Center and cheer him on. Once the OPD Follow-Vehicle is out of range of the Pahrump radio, the Pahrump Comm Center shuts down. Here (L-R) Ken W6HHC and Nicholas AF6CF start tearing down the antennas before they go to bed...to make packing up go faster after breakfast.. 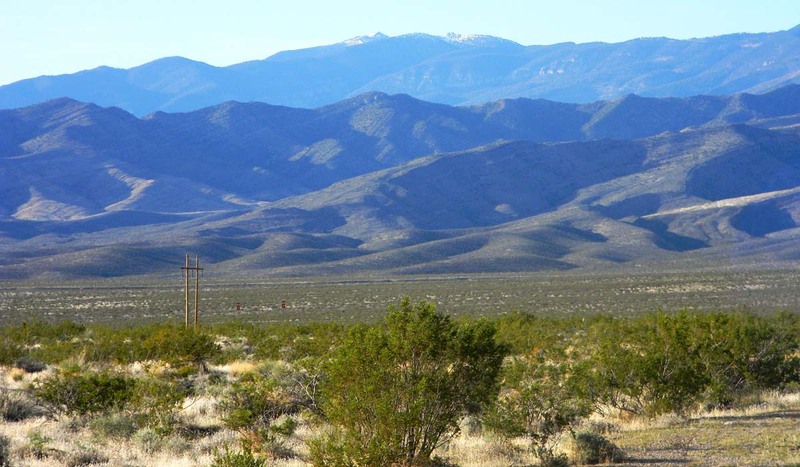 The Sandy Valley Road location is in "the middle of nowhere". 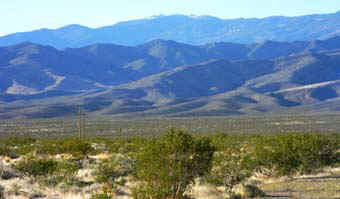 This a view of the mountains to the North. 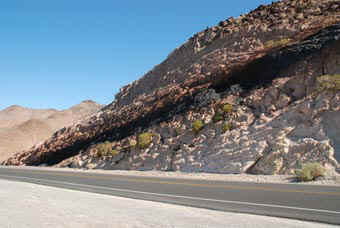 The race course road is about half-way to the foot hills. The view in every direction is just as isolated. 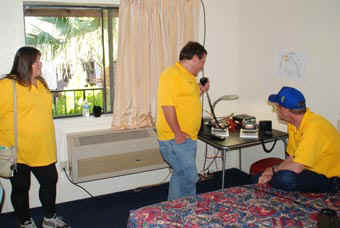 There are no fancy hotels (like in Shoshone) at Sandy Valley Road. The Comm Center is located in these trailers. Note the small breeze on the flag. 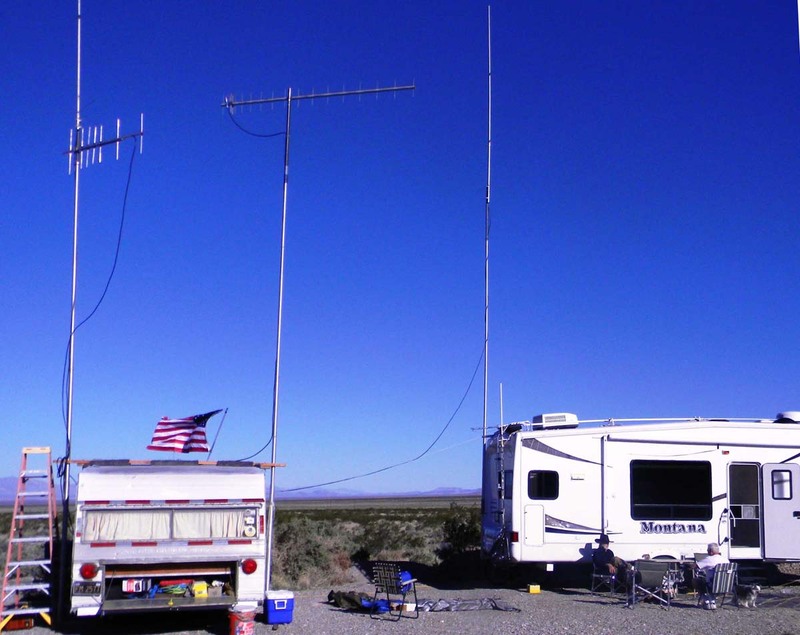 Here, the antennas are all set up, radio checks have been made to all the other comm centers...and they are taking a break. The cross-band repeater kept communi- cations flowing on both sides of the mountain ridge to the East. you can take the time to enjoy some outstanding sunsets. In the suburbs of Las Vegas, Sgt Mike Monjaraz (center) takes the baton hand-off from finishing runner Christian Romitti during the early morning hours. 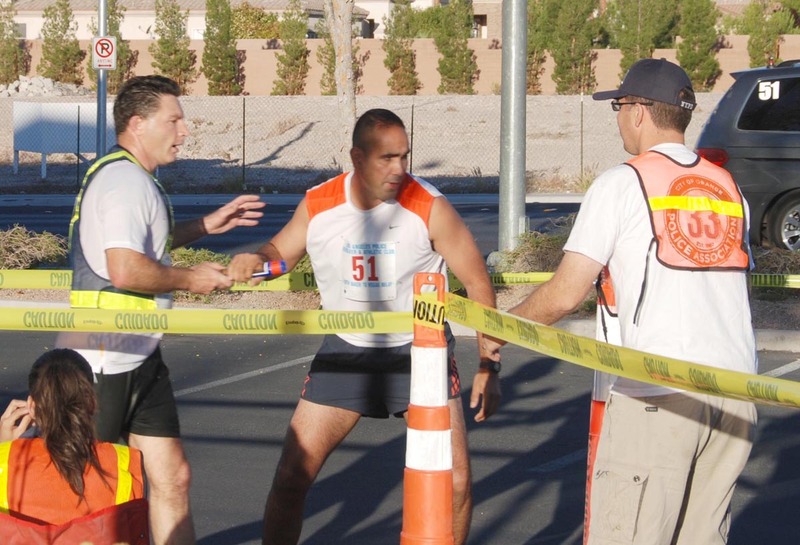 The person with the OPD support staff vest on the right is called a "catcher" and has the job to ensure that the finishing runner does not need medical help after his run. 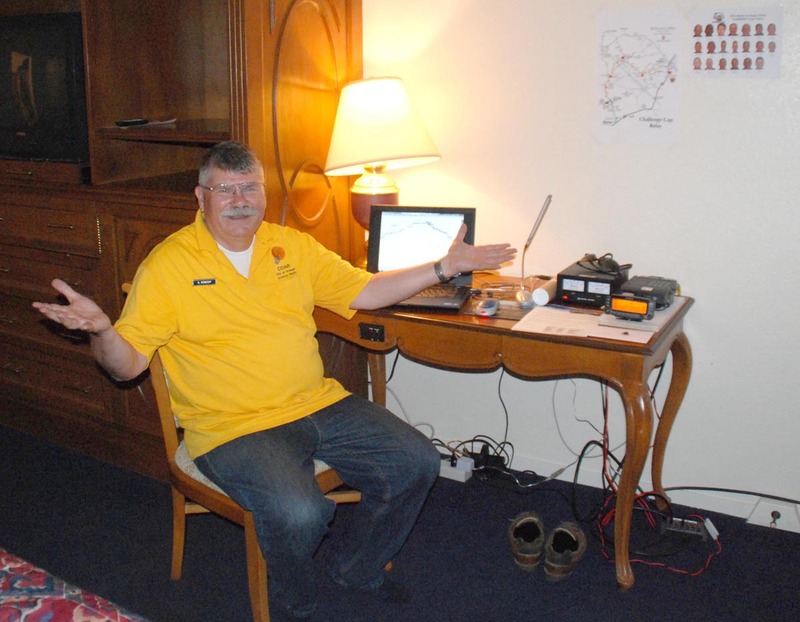 This year in Las Vegas, COAR set up in a motorhome across the street from the Emerald Suites motel. 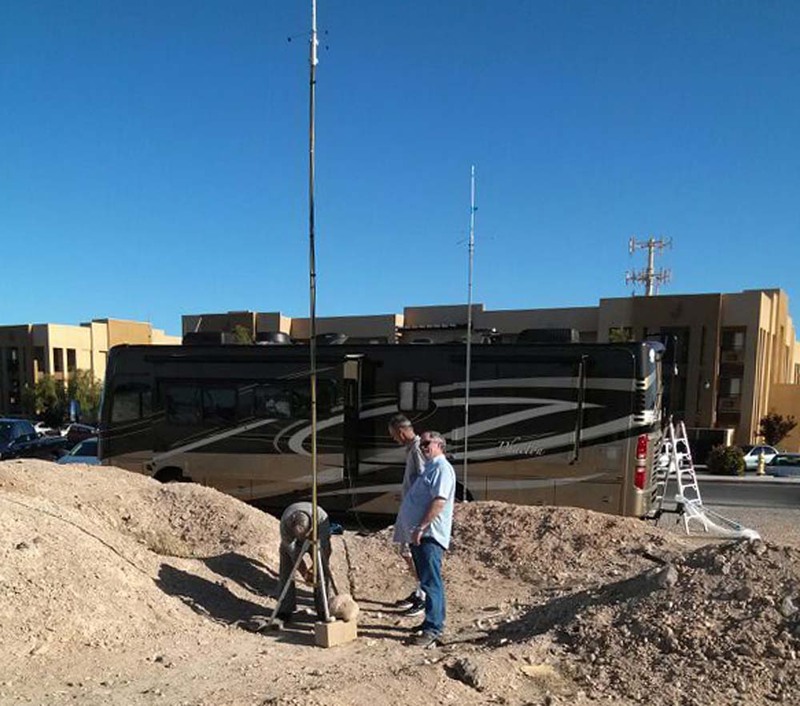 The team is setting up an APRS antenna. 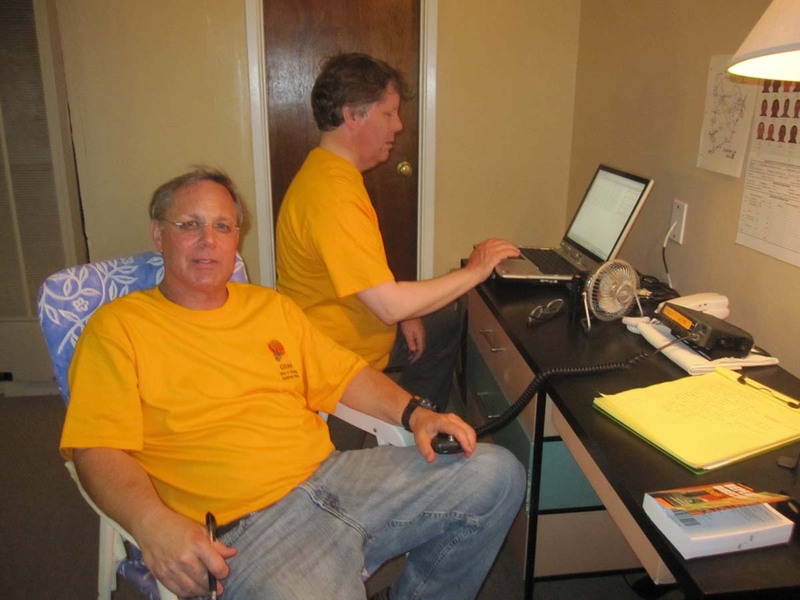 At Las Vegas Comm Center are (L-R) Steve KI6DDE and Mike KF6QFY are waiting for the race to begin..
At the Las Vegas Communications Center, Robbie KB6CJZ keeps record of the team 051 runner's times for each leg during the race. 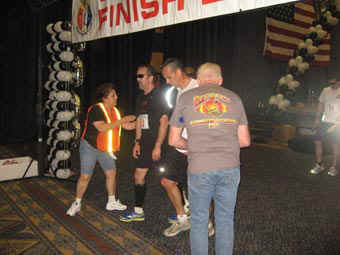 The finish line was located inside the LVH Hotel in LV (previously known as the Hilton Hotel). Here is the final OPD runner, Officer Dave Nichols (in black T-shirt), crossing the finish line on Sunday morning. Orange PD improved their standing this year by placing 42nd out of the 276 running teams. 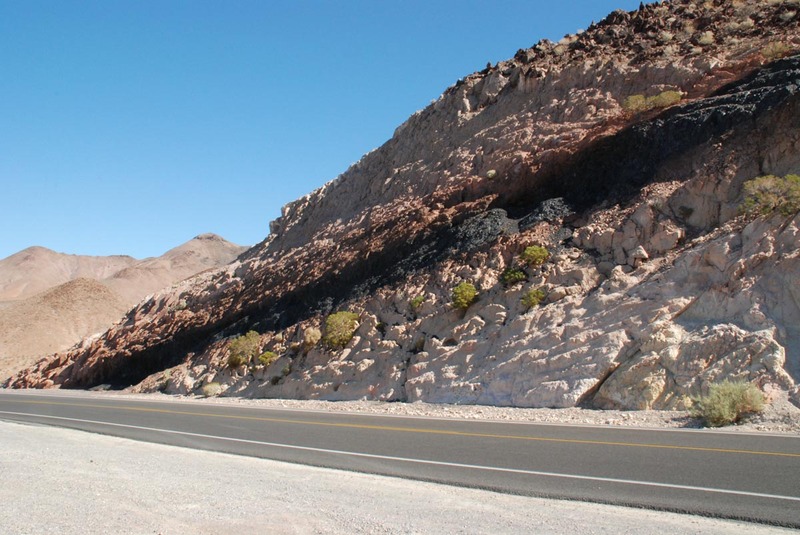 A well known land mark along the highway between Shoshone and Pahrump is this vein of black "volcano glass" (aka obsidian). It can be seen on the hillside while miles away. 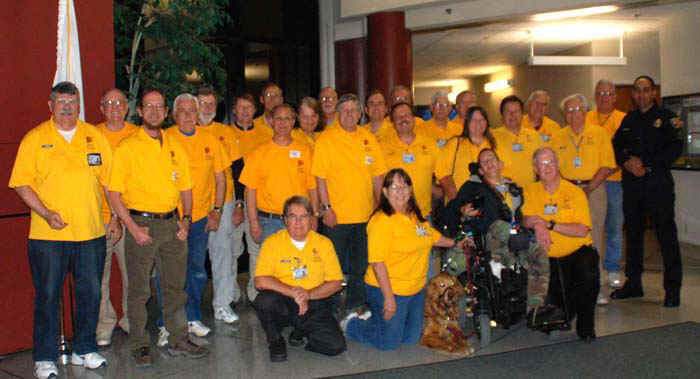 This group photo shows most of the volunteers who helped COAR RACES provide race communications for the 2012 Orange Police Department B2V running team.